A Martinez looks at an iPad menu at MedMen in West Hollywood. The new year brings new laws in California. One of the buzziest? Legalized recreational marijuana. Retail sales began Monday at around 90 state-licensed shops. 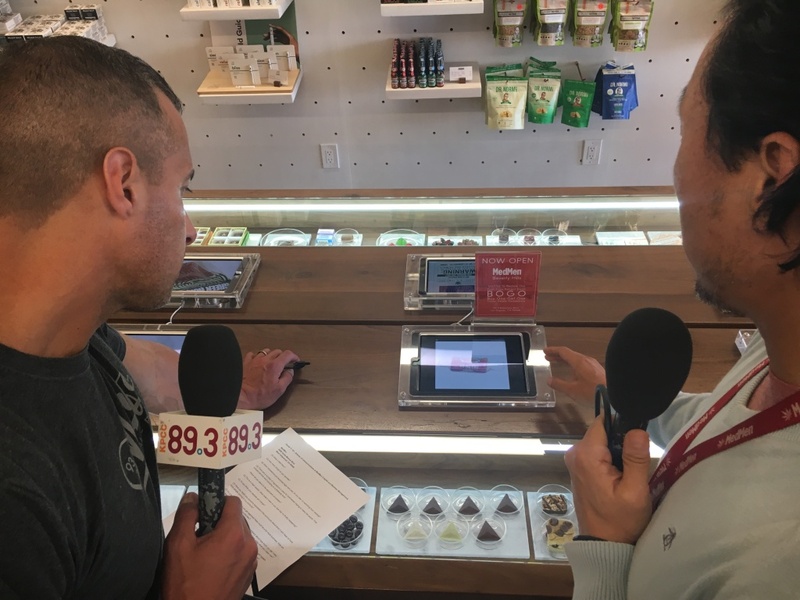 Others in the state planned to begin sales Tuesday — including MedMen in West Hollywood, which opened for business at 10 am. Company spokesman Daniel Yi was there. He told Take Two that the energy level behind the scenes was "very high." No pun intended. We've been preparing for this for months. So we've been stocking up on products. On [December] 31st, we had our staff working diligently to clear the sales floor of any products that are no longer compliant under the new guidelines. There's a bagel food truck right in front of the store. People are milling around there. Everybody's waiting very anxiously for the doors to open at 10 am. Later, a line formed outside. Pot shops ready themselves in the New Year, wildfire lessons from Australia, should you take resolutions from a self-help book?